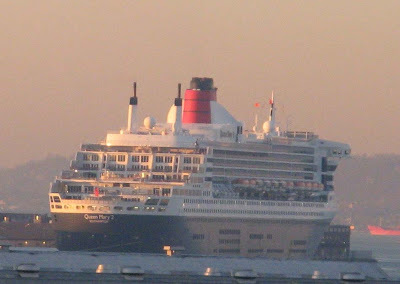 On Sunday, January 13, all three of Cunard's great cruise ships: Queen Elizabeth 2, on one of her last voyages before going into retirement as a floating hotel in Dubai; Queen Mary 2; and Queen Victoria, on her maiden voyage, all entered New York harbor. Above is Mary, docked at Pier 17, Brooklyn, located in the Red Hook neighborhood. This shot was taken at about 7:15 a.m. from the Brooklyn Heights Promenade. 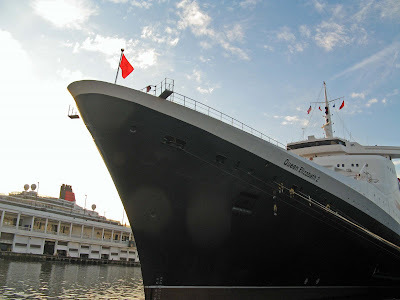 That afternoon, I took the subway to West 59th Street in Manhattan, and walked over to the Cruise Ship Terminal, where QE2 and Victoria were docked. Here's the bow of QE2, with the funnel and upper superstructure of Victoria looming over the pier to the south. QE2 was bunkering at the time of my visit. This view shows the clean, "shipshape" lines of her superstructure (in contrast to those of newer ships like Victoria). It's hard for me to believe this ship has completed forty years of service, including being pressed into duty as a troopship during the brief but bloody Falklands War. Note the shadow of Victoria on QE2's superstructure. Above is a view of Victoria. 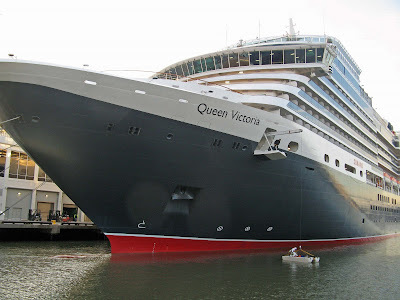 To my eye, the design of her superstructure, with the decks cantilevered outward like an inverted wedding cake, is not as pleasing as that of QE2. Improvements in hull design and more effective stabilization have allowed naval architects to design ships that look more and more like landlocked resort hotels. This has been a boon for the ships' owners, who can accommodate more passengers and provide more commodious public spaces in their vessels. Note the small, twin-hulled boat just below Victoria's bow. 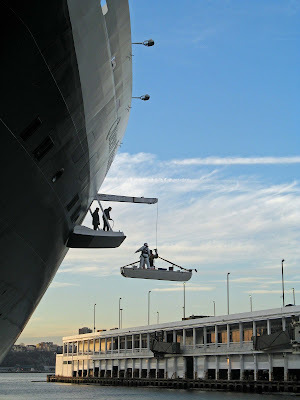 Here the boat, evidently used by crew members to inspect Victoria's waterline, is being hauled up by crane, to be stowed inside the ship's hull. 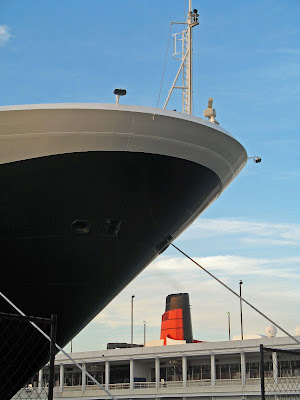 Finally, below is a view of Victoria's bow, with QE2's funnel in the background. That evening, the ships left their docks and gathered near the mouth of the Hudson, just north of the Statue of Liberty, where they remained during a fireworks display before departing on their voyages. Unfortunately, lacking a tripod, I was unable to get any good photographs of this event, which I watched from the roof of my building. 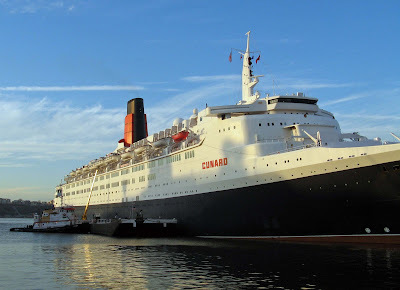 This Dutch Site has animated views of QE2 and Victoria arriving at their piers, and also still photos of the fireworks. To see the latter, click on the word vertrek near the bottom of the page, then click on volgende to advance from one photo to the next. 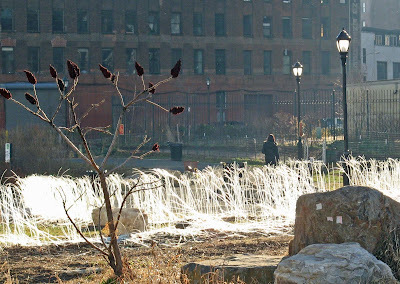 Farewell to "The Third Bridge"
Two mornings ago, while on my customary early run through Brooklyn Bridge Park in DUMBO, I paused to take a photo of part of Osman Akan's "The Third Bridge" illuminated by the rising sun. "Third Bridge", which was installed last October, was due to be taken down today. crowned, had Johnny Podres on the mound. - Marianne Moore, "Hometown Piece for Messrs Alston and Reese"
I've told before how and why the Brooklyn Dodgers became my first love in baseball, and that 1955 was my first remembered and defining World Series. So it's with particular sorrow that I read that Johnny Podres, winner of game seven of that Series, and of the Dodgers' first championship, and that over the hated Yankees, died today at seventy-five. I'm glad, however, to see that Johnny's fellow pitcher from the '55 team, Don Newcombe, still lives, along with teammate Tommy Lasorda and former Dodger GM Buzzie Bavasi. Update: Arch, in a comment on my parallel post in WikiFray, says Bob Gibson is for him what Podres was for me. I couldn't find a poem about Gibson, but I did find another blog with a link to an MP3 of my favorite baseball writer, Roger Angell, talking about Gibson. Anyway, Arch, I've got to admit: Gibson was simply the greatest pitcher of his era, and probably one of the five or so best of all time. Oh, yeah, and as I've said before, if I had to pick a team purely on aesthetics, the Cards would be my choice.